Libraries are the heartbeat of local communities used by young and old for a variety of activities. 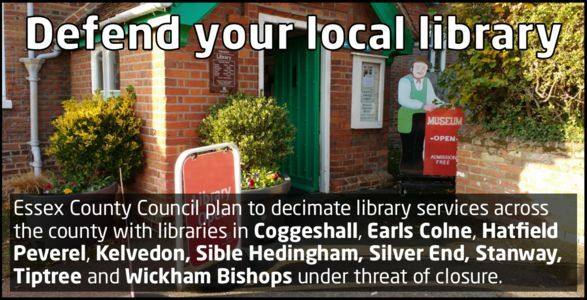 Essex County Council plans to decimate library services across the county, with libraries in Coggeshall, Earls Colne, Hatfield Peverel, Kelvedon, Sible Hedingham, Silver End, Stanway, Tiptree and Wickham Bishops under threat of closure. These plans are unimaginative, short-sighted and further undermine community life in our small towns and villages. Libraries are more than just buildings, they are community hubs; services provided by the professional staff who work in them. We call upon Essex County Council to rethink their closure plans and develop proposals for an inclusive and properly supported library service fit for future needs and demand.